We have produced cDNA libraries from high quality RNA extracted from the peltate glandular trichomes of 4 sweet basil lines: EMX-1, SW, Sweet Dani and MC. After sequencing random clones from these libraries, we have obtained a total of 24,248 ESTs. We have worked with Dr. Cari Soderlund’s group, at the Arizona Genomics Computational Laboratory, to make the basil peltate glandular trichome ESTs available in a database system (called PAVE, for Program for Assembly and Viewing of ESTs) that is easy to work with and analyze. This database is now available to the public. A paper describing the database will soon be submitted for publication. 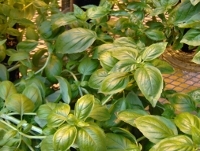 We have redone the assembly of the basil ESTs, and two versions of the assembly are available, one with more stringent parameters to exclude less similar sequences from contigs, and one with less stringent parameters, allowing alleles to group together. These are accessed by selecting either the “published Assembly” or “current Assembly” under the Advanced Search directive. We gratefully acknowledge the National Science Foundation (Grant MCB-0210170) for support of this project.